Industrial or business-to-business marketing places very specific demands on those responsible for it. Yet all too often the strengths of these managers are technical, founded on expertise and product knowledge. There is seldom any formal understanding of marketing principles and the business benefits they can bring. In such conditions perspectives are narrowed, opportunities are missed, and marketing remains a functional support activity rather than a strategic resource. Building on a basis of recent Cranfield research and their own extensive work with experienced practising managers, Paul Millier and Roger Palmer have devised the perfect solution. 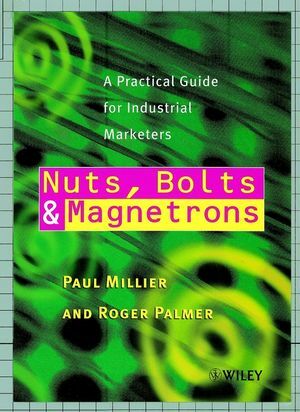 A complete reference and toolkit for managers in the field, Nuts, Bolts and Magnetrons showcases a wealth of examples from European industry, and provides the information and guidance industrial marketers need to develop and prosper. Readers will learn how to be not only functionally efficient, but also effective, by managing relationships within and outside the firm. If you are involved in industrial marketing then you must be properly equipped. Blending insight, information, and inspiration in equal measure, this book offers all you need for success - the Nuts, Bolts and Magnetrons of modern marketing. Paul Millier is visiting professor at Cranfield School of Management and professor of marketing at Lyon University Management School. His last book, a up-dated translation from the French on the marketing of high techgoods is currently in production.